Eternity rings are a truly lovely way to commemorate any occasion. They definitely make wonderful gifts for birthdays or anniversaries, but they can also be used on other occasions where colors play a role in the significance. Not only that, but because eternity rings are stackable, you need not stick to one color motif and can mix and match with other gemstones. For instance, with the 4th of July coming up, many Americans are gearing up and getting ready to show their patriotism. The colors of red, white, and blue abound in a number of different ways and another way to show this is to equip yourself with ruby, diamond, and sapphire eternity rings. 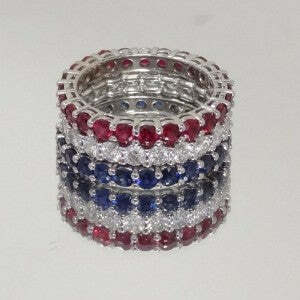 They can also make great gifts for mothers who may want to wear a ring with the birthstone of each of their children. Check out our precious gemstone birthstone guide for a list of the birthstone options that we offer to help you shop. We have an eternity ring option for each month of the year and will even gladly take requests for custom options if you don’t see exactly what you’re looking for. Don’t think that eternity rings are limited to representing birthstones of children either. They can stand for the birthstone of the mother, other significant family members, or even be the gemstone for that particular anniversary. An eternity ring for a mom can be gifted to them at virtually any time like as a push gift for an expectant mother, an anniversary gift, a birthday gift, Valentine’s Day, or a winter holiday like Christmas. They are incredibly versatile rings, but they need not be limited to those “big holidays” or occasions and can be used for a graduation, beating cancer, or maybe as a wedding band option. For some of the lesser events in life, we understand that some of our clients may not want to spend a whole lot for something like a promotion at work or a graduation, so they may want to spring for one of our landmark eternity bands. Landmark eternities are much more cost effective eternity ring options that utilize more metal and less precious gemstone giving them a lower price point. They’re lovely, elegant, and simple choices that can be used for the same occasions as a standard eternity band, but are also perfect for celebrating one of life’s many milestones or to even be used as a wedding band. No matter what style of eternity ring you spring for or what occasion they represent, the greatest message they give is that your love for the person is eternal. Whether it’s imbued with extra sentiment with the symbolism of a particular gemstone like sapphire for sincerity and faithfulness, or is representative of a person in your life, an eternity ring is a thoughtful and meaningful gift because the sentiments it is imbued with lasts for an eternity. We hope you enjoyed this look into the eternity ring style. We have an incredibly large selection of eternities where anyone could easily find a favorite.